When the Sublett’s arrived they made their home in Powhatan County, on the James River approximately 18 miles west of Richmond. They settled where the former Monacan Indians had made their home in Manakin Town nearing falling creek. However, due to the harsh conditions, some left and moved westward. The first ancestor that I can be document at this time is Jean Soblet, born about 1633, died about 1681 in Sedan, France. His son Abraham was the first of our family to seek refuge in America. Ship Mary and Ann-In 1700, Abraham came over with 2 children, leaving his wife to emigrate at a later date (Passenger and Immigration Lists Index, 1500s-1900s) (Brock pg. 255). (Passenger and Immigration Lists Index, 1500s-1900s). “Among those who are to receive of the miller at Falling creek one bushel of meal a head in February, 1701, are Soblet, his wife, and five children.” (Citation-A partial History of French Huegenots by Samuel Sublett, 1896). My great-grandfather, Thomas Irving Moss was born 20 January 1877 in Buckingham County, Virginia. I have been having a hard time going back further on this side of the family with any real certainty, so that is why I chose to write about him today. I have his parents listed as Thomas Moss and Margaret O’Brien both whom were also from Buckingham County. 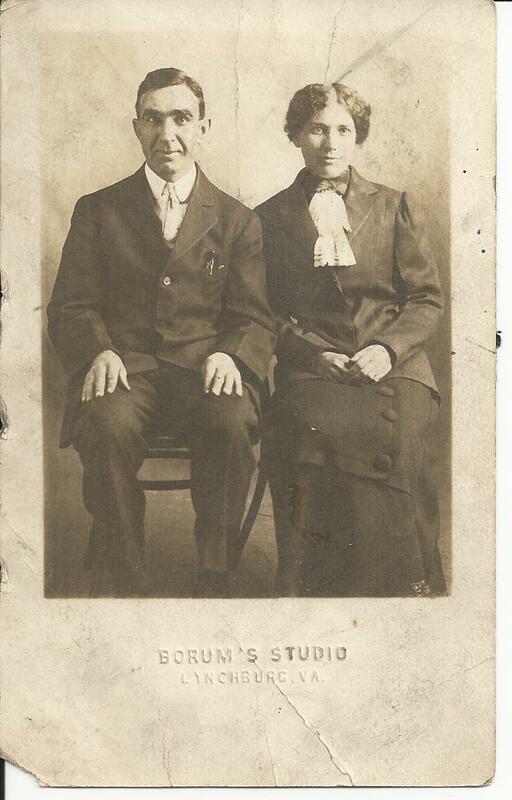 Thomas Irving married Carrie Lou Hicks in Lynchburg, Virginia on 20 August 1913. According to the marriage certificate, Thomas was listed as widowed, but I have not been able to find proof of this or another marriage. In 1918, Thomas Irving Moss signed his World War I Draft Card, this document shows that his address was 131 Choppell Street, Petersburg, Virginia. Where he worked as a carpenter for Dupont Powder Company in Hopewell, Virginia. If you read any history about Hopewell at this time, you will read about a big explosion that occurred a few years earlier. So it was likely that Thomas was there to help with the reconstruction. This company produced gun cotton during WWI. By the 1920 census, Thomas is back living in Lynchburg with his wife and two daughters (Virginia Odelle and Lillian Scott). I have been doing genealogy for about five years. As most genealogists realize there is only one greater joy than the initial discovery; it is the ability to share the new information, stories and facts with others who might appreciate it. I am sitting here on a southbound flight after an amazing weekend with the family. Amazing in the sense that I realize just how much information I have that I want to share and how much more information I want to gather. It has been about a year since I took a genealogy trip with my mom, sister and aunt. Since that time, I have been pondering how to put a book together. The project seems so immense, daunting and insurmountable. I was reading a genealogy article about blogging. I thought to myself, self, I can do that. If I post some of what I have as I go; bit by bit, eventually I would have a piece of work that others could enjoy. The added benefit of the blog is that you can post as well. Your feedback, additional stories and questions can help drive the blog. My committment is this, I will strive to post one time per week at a minimum. I want to encourage the readers to add supplemental stories, etc. This will be our family’s blog. At this point, I do not have a plan as to what side of my family will be posted and when. You will have to come back and see. I was not an English major, so you will notice that right away. I will strive for variety, informative and the mundane, as it will be through this whole body of work that hopefully something complete will be formed. My father has never been a story-teller. I am not sure why, because he is actually pretty good at it. This weekend some of the family convened to my sister’s home to celebrate the high school graduation of my nephew Connor. My younger brother, Joe, his wife, Bethany, and I were visiting with dad on the porch when somehow we started talking about Dad growing up. Maybe we were just feeling nostalgic remembering our high school days or maybe we were just passing the time. Regardless, I said to Joe that one of the few stories I remember Dad telling me was when the cops took their winnings in a craps game. You have to understand, my father grew up in the 40’s and 50’s on the south side of Chicago. His family was not wealthy. They were on the cusp of being poor and the working class. As the police left, Jimmy and Dad were relieved that they were not getting hauled off to the local precinct. Dad still had a pocket full of dice, and Jimmy and Dad split what was in the vase.